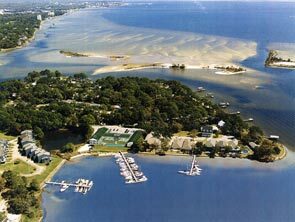 The Landings of Pensacola is located on the Emerald Coast in beautiful Pensacola, Florida. Pensacola is the home of the world's most gorgeous beaches where the shimmering white sand stretches for miles. These beautiful one and two bedroom condominiums offer you a unique opportunity to invest in the Emerald Coast. Enjoy the warm Gulf breezes, sugar white sand between your toes and the gentle rhythm of the gulf waters. 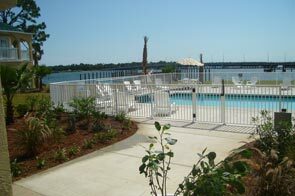 Each condominium is modestly priced and includes your own boat slip. Each boat slip is located only 5 minutes away from 75 foot deep water in the Gulf of Mexico. Founded in 1559, Pensacola was the nation's first settlement and is steeped in history. Strolling through downtown and glancing at the buildings' brick facades and wrought iron balconies immediately brings to mind New Orleans. Pensacola has a wide variety of excellent restaurants, diverse museums and theatres, and a picturesque waterfront. Pensacola is also home of the Blue Angels and the National Museum of Naval Aviation. For a visual tour of Pensacola click here! If breathtaking sunsets, gorgeous beaches, world class fishing, delectable seafood and peaceful walks on the beach are your idea of the perfect vacation or even second residence, come to Pensacola FL!